Showy Succulents for Snowy Climates (Debra’s WSJ Article): A shorter version of this article appeared in the Wall Street Journal, 3/9/18. This is the unabridged original. Is it a given that Northerners can’t grow succulents? Not at all. Granted, most of these moisture-storing, arid-climate plants prefer warm, sunny habitats. Yet in response to demand, major growers are cultivating tough, showy varieties that sail through subzero winters. The two main kinds are stonecrops and hens-and-chicks, but there are others that may surprise and delight you. Golden barrel cactus is cold hardy only to 14 degrees F, but dainty-looking ‘Angelina’ stonecrop will go well below zero. 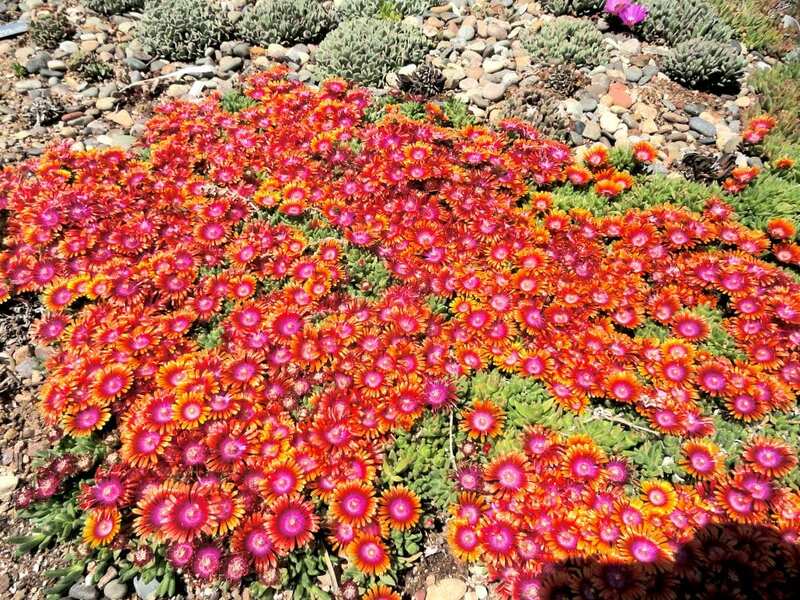 Arguably the best known cold-hardy succulent, because of its wide distribution and tolerance for nearly any climate except desert, is Angelina stonecrop (Sedum rupestre ‘Angelina’). The feathery-textured ground cover turns from chartreuse in summer to orange-tipped gold in winter. This trailing spreader makes a good filler plant for potted and in-ground gardens alike. Plant breeder Brent Horvath of Intrinsic Perennial Gardens in Hebron, IL is perhaps best known for upright sedums with serrated chartreuse leaves and flowers that blanket the plants with clouds of pink. Horvath authored “The Plant Lover’s Guide to Sedums” (Timber Press, 2014). Succulent hens-and-chicks, so called because offsets ring the mother rosette, are in the genus Sempervivum, meaning “ever-living.” “Many of our semps and hardy sedum spent over a month buried in 18 inches of snow last year, resulting in tremendously vivid red, pink, purple, and even some orange tones later in the spring,” says Matts Jopson, VP of Mountain Crest Gardens near Mt. Shasta in Northern CA. “They also survived a record -15 F night without issue.” Certain semps will look different throughout the year, depending on variety and climate, and warm colors caused by cold may settle into shades of green by late summer. Many are more tolerant of indoor light than semps. Hybridizer Kevin Vaughn’s book. Release date: May, 2018. Vaughn’s book is a must-have for semp enthusiasts: Sempervivum: A Gardener’s Perspective of the Not-So-Humble Hens-and-Chicks. Among professional breeders of cold-hardy succulents mentioned by Jopson and Kelaidis is Chris Hansen of Michigan-based Garden Solutions (chris@sunsparklersedums.com). Hansen says of one of his cultivars, Sempervivum ‘Gold Nugget’, “It’s a once-in-a-lifetime plant, the world’s first bright yellow semp with red tips.” In northerly climates, ‘Gold Nugget’ turns shades of lime green and hot pink in summer, gold and red in spring and fall, and warm red in winter. Chris Hansen shows Sempervivum ‘Gold Nugget’, part of his registered Chick Charms line of hens-and-chicks. See more of Hansen’s patented plants, including his SunSparker Sedums, on my 50 Cold Hardy Succulents for Northern Climates page. His online mail-order plant business (with Mary Walters) is www.GreatGardenPlants.com. Sempervivums are monocarpic, meaning that after a rosette blooms, it dies. But this seldom compromises a colony’s appearance. Chicks carry on, filling gaps with their own offsets in spring. Naturally Kelaidis mentions ice plants, of which he says tongue-in-cheek, “I invented 35 years ago.” He trekked through Siberia, Mongolia, and similarly remote, high-elevation regions seeking mat-forming succulents with shimmering, daisylike blooms. Kelaidis went on to introduce many—including his own hybrids—to gardens in the Rockies and beyond. “Wetness is the enemy,” cautions Kelaidis. “Plant them in walls, rock gardens and shallow containers.” Give in-ground plants maximum sun exposure and “a microclimate similar to a Russian steppe:” a south-facing slope amended with coarse, gritty soil.